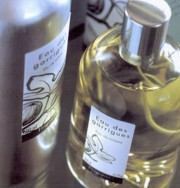 Eau des Garrigues is another fragrance from the Naturals line at Fragonard (see yesterday's Cerisier en Fleurs). It was released in 1997, and features notes of fig tree, bergamot, neroli, magnolia, honeysuckle, freesia, cardamom, nutmeg, pepper, and oakmoss. Eau des Garrigues starts with fig and citrus. The fig is strong in the top notes, but the sweetness is minimal at most: it does smell more like fig leaves than the fruit. The fig fades somewhat as the fragrance settles, but Garrigues stays very dry, almost dusty, and the combination of leaves and spices produces an accord that smells very much like green tea leaves, maybe even gunpowder tea with its slight hint of smoke. The floral notes are subdued but soften the harsh edges a bit, and there is quite a bit of oakmoss. Eau des Garrigues is my favorite of the Fragonard Naturals. It smells green and summery, with woody undertones, and the spices give it a nice kick. It is very much a unisex scent, and has reasonable lasting power. For purchasing information, see the listing for Fragonard under Perfume Houses. Update: Eau des Garrigues has since been discontinued, although a new fragrance in the Naturals line, Figuier Fleur, appears to have identical notes; perhaps it has just been renamed. I must say that Eau de Garrigues is definitely my favourite Fragonard, although they tinkered with it slightly in the past few years, it seems. When I first tried it at some shop in France in the late 1990s, it definitely smelled like garrigues, that underbrush of wild herbs that covers the hillsides of Provence and Languedoc. Now it seems a little bit more floral to me, although it is likely that it is my perception that is playing tricks on me. Be as it may, it is still a lovely summer fragrance that I really enjoy. Thank you for a beautiful review! I always thought “fig was fig”, I didn't know there was a difference between fig leaves and fig fruit in a fragrance. Thank you for describing the fig leaf so wonderfully! Well, fig probably is fig, I mean, its all probably synthetic anyway, right? But this doesn't smell fruity the way that some figs do, with that hint of creamy coconut as in Premier Figuier, for instance. It doesn't smell like anything you would eat. Yes, that is a good development I agree with your point below on fig–most smell to me like green figs, rather than ripe ones. Ripe figs have a rather delicate scent anyway, therefore I can see how fig branches, leaves or unripe fruit are more useful for perfumery. It is such an uplifting scent. Great review! I so enjoy reading them. I know without a doubt to stay away from Garrigue. Actually, none of the Fragonards have impressed me much. I've gotten some horrible headaches from those I've tried. Interesting…I have tried more of the Naturals line than the regular womens line, and of course, the naturals are mostly pretty light. Will see if any of the others are headache inducing for me when I get to Takashimaya again. Aha! I have a vial of Garrigues hanging out on my dresser somewhere. I have seen it. Gonna try it tonight. Aha — let me know what you think! Well, I tried it, and I ended up washing it off. Surprisingly not my thing. The dustiness of it got to me. I felt like I smelled…dirty. I got kind of sneezy, too. Oh well. So much for that, LOL! Dirty & sneezy is not good.